Dr Marilena Mousoulidou is a Lecturer in Cognitive Psychology in the Department of Psychology at Neapolis University Pafos. She received her PhD in Cognitive Psychology from the University of Leicester, UK (2010), and her BSc in Psychology from University of Derby, UK (2004). She has worked as a visiting lecturer at various Higher Education Institutions in Cyprus, teaching a variety of psychology modules for undergraduate and postgraduate students (2010-2015). 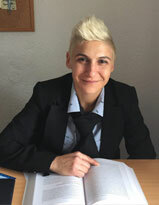 Since 2014 she has been a member of the Department of Psychology at Neapolis University Pafos, initially as a Visiting Lecturer (2014-2015) and subsequently as a faculty member of the Department.